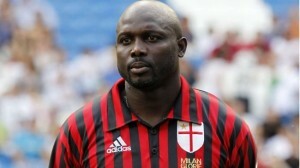 George Weah is angry, and very angry. The Ballon d’Or in 1995, who played for AC Milan from 1995 to 1999, has not digested the poor performance of the players of his former club against Atletico Madrid on Tuesday night in the knockouts second leg of the Champions League. Joined by our colleagues from Tuttosport, the former Liberian football glory unleashed his anger, uttering a loud yell. “Milan is a scandal! We must stop! If I were leader, I‘d fire the whole team and I will start from scratch! Newspapers will talk about Seedorf but it is not his responsibility. It is a bad habit. It is not he who errs in tactics or team compositions. It is rather the players who have their heads in the feet and legs in the head!”, He says, very furious. Commenting on the reviews of Zvonimir Boban, another former glory of AC Milan (who said a few weeks ago that the current Milan defenders were unworthy of the tradition of Costacurta, Baresi and Maldini), George Weah denounced the lack of seriousness displayed by the men of Clarence Seedorf. Beaten 1-0 at San Siro in the first leg, AC Milan has again tilted 1-4 in the second leg. Eliminated from the Champions League, the Lombard club has almost no chance to participate in a European competition next season, because they are stuck to an unflattering 10th place in the league.